While the Curiosity and Opportunity rovers continue to gobble up the headlines as they explore the surface of Mars, we must remember that there are still working satellites in orbit around Mars. One of them is the Mars Reconnaissance Orbiter, which carries the superbly well-designed camera system HiRISE. 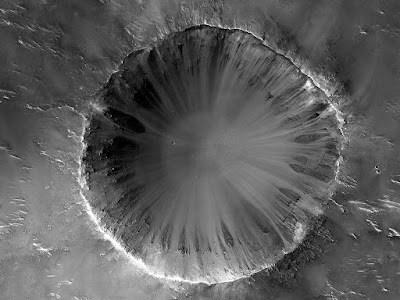 For years since the MRO went into Martian orbit, HiRISE has been taking astonishing high-rez pictures of the surface. So good, in fact, that it has occasionally captured pictures in which the roving landers can be seen.